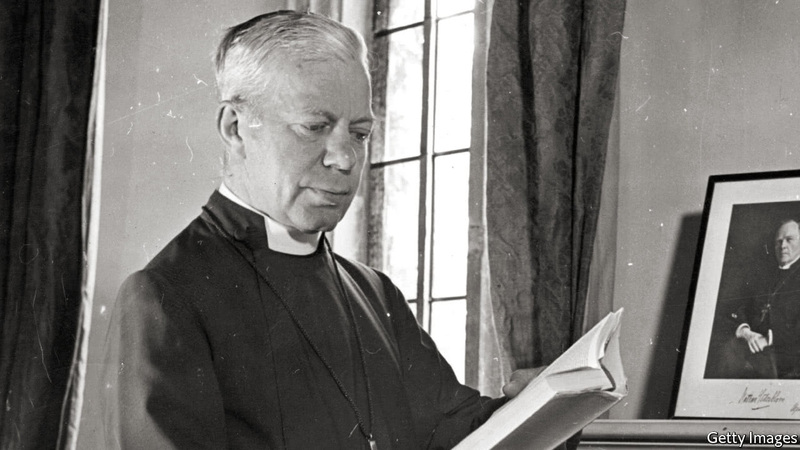 GEORGE BELL, who died in 1958, was long regarded as one of the most brilliant and morally courageous representatives of the Anglican Church in the 20th century. Alone among English bishops, he opposed the indiscriminate bombing of German cities during the second world war. As a member of the House of Lords, he joined a handful of Labour members of the House of Commons in questioning the morality of annihilating German civilians. Bishop Bell had maintained warm contacts with German Christians since the 1930s, when he supported a movement of Protestants who were standing up to Hitler. He backed his German friends in resisting efforts by Hitler to create a kind of ersatz Nazi-oriented form of Christianity. After the war, he was a strong supporter of nuclear disarmament. When the office of Archbishop of Canterbury fell vacant in 1944, he was a contender for the leadership of the English church. But Winston Churchill disliked the unruly cleric’s stance on aerial bombing and resisted the appointment. Sixty years after his death, the bishop has once again become an apple of discord. This week seven of Britain’s leading academic historians penned an open letter to the present Archbishop of Canterbury, Justin Welby. Their complaint is that Archbishop Welby is giving undue credence to allegations that Bishop Bell was guilty of sexually abusing children, even though it has been established that the investigation of those allegations was flimsy and deficient. The current turn of the story goes back to 2015, when the Bishop of Chichester, Martin Warner, issued an apology to a woman known as “Carol” who said that she had been serially abused by the famous prelate during her childhood. She also received around £15,000 ($20,800) in compensation. “Carol” alleged that she was often brought along to the Bishop’s Palace by someone who worked there, and that the bishop would gain her attention by offering to read her a bed-time story. The church’s apparent acceptance of these allegations triggered a movement in defence of Bishop Bell’s memory. His defenders insisted that the accuser’s account did not correspond with what was known about the layout of the palace or the handful of people who lived and worked there. To shed light on the matter, the church asked Lord Carlile, one of Britain’s top barristers, to ascertain whether the allegations had been properly investigated. He reported in December that the investigation had been hugely deficient because it did not follow a process that was fair and equitable to both sides and failed to give proper consideration to Bishop Bell’s posthumous rights. But Lord Carlile was not authorised to pronounce on whether the bishop was guilty or innocent. We believe the historical figure of George Bell is safe in the hands of historians even though, very sadly, it would appear to have been impugned from within his own Church of England. The historians insist that they are not implying that the accuser is speaking deliberate falsehoods: merely that the things that she believes she remembers should be cross-checked against other available evidence. On one point, at least, Sir Ian and his colleagues deserve a hearing. Bishop Bell’s record as an internationalist and humanitarian is a matter of general historical interest, not just a detail in the history of the church. It follows that the investigation of his life should be conducted outside the confines of the church, as transparently as possible, with a fair hearing for all interested parties. That has still not happened. This entry was posted in Bishop George Bell and tagged "Carol", 'Erasmus', Archbishop of Canterbury Justin Welby, Bishop George Bell of Chichester, Bishop of Chichester Martin Warner, Professor Sir Ian Kershaw, Religion and Public Policy, Seven Academic Historians on January 20, 2018 by richardwsymonds37.